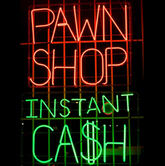 Dans Pawn provides pawn services such as loans, jewelry, pawn an item, sell an item, layaway program, and pawn tickets. The Dans Pawn Company was founded in the year 1995 and has locations at St Andrews, and Springfield. The services of the company extends to quick cash loans, pawn broking, good quality jewelry at a decent fair cost, and also provides facilities for selling antiques and cash for gold. Dans Pawn is serving the need of residents of Panama City with pawn loans for 30 days and a 30 day grace period. The loan amount is normally 50 percent of the resell value. There are currently 0 consumer reviews about Dan's Pawn available. Share your review. Please take a note that you are about to post a public review about Dan's Pawn corporate office on CorporateOffice.com. This review will be public, so please do not post any of your personal information on this website. If you would like to contact the corporate offices of Dan's Pawn, please use their contact information such as their phone number, website, and address listed above to contact them. However, sometimes staff from Dan's Pawn headquarters do read the reviews on this website.